Need more information about booking Home 602213 ? 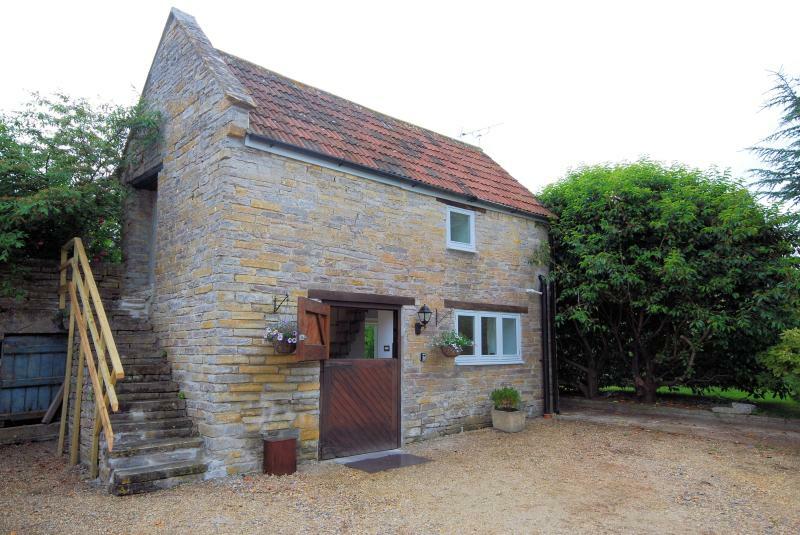 This lovely barn has been sympathetically converted to provide a fabulous holiday home on the edge of the Somerset Levels, less than 1 mile from the traditional town of Langport it provides the perfect retreat for a couple. Walk to one of the three dog friendly local pubs serving great food and local beer and cider, watch the wildlife along one of the walks across the levels or cycle along the car-free tracks or flat roads. Alternatively travel a short distance to visit one of the many local attractions or market towns. At the end of the day relax in the hot tub or sauna, swim in the heated pool (up to 28 degrees in summer), snuggle in front of the wood burner or sit under the Cherry tree in the private garden. Leisure facilities: Private hot tub, table football, shared outdoor, heated swimming pool and croquet lawn (May to end of September). Outside: field available to exercise dogs. Amenities: ample parking. Bed linen and electric included. Wi-fi available on site. Towels included. Regret no smoking in the property. Location: walks straight out with woods, marshes and rivers. Beach 45 minute drive, shop and pubs under 1 mile. Accessed through a separate driveway, the accommodation is spacious and furnished to a good standard and offers ONE bedroom: double with en-suite shower room and WC, please take care as the bedroom is accessed via a steep open-tread space saver staircase, there is also an external stone staircase which provides access to the bedroom. Lounge/kitchen/diner: downstairs open-plan with TV, DVD, Freeview, woodburner (first basket of logs free), cooker, fridge and microwave. Shared utility: with washing machine in outbuilding. Outside: enclosed private garden with seating, hot tub and BBQ. Amenities: electric heating included. 2 pets welcome by arrangement. We welcome you when you arrive and are always available if you need us. But if you don't need us then you wont see us. We check the hot tubs and pool discretely several times a day to make sure they are always in tip top condition. Dogs are welcome but not to be taken in the bedroom or on sofas and not to be left alone inside the house. This Barn has 1 bedroom, 1 bathroom and sleeps 2. It’s been listed on Holiday Lettings since 06 Sep 2013. Located in Somerset, it has 26 reviews with an overall rating of 4.5. The average weekly rate is £373. My husband and I stayed here for four nights in September, the Cider Barn that we stayed in was fairly small but with that it gave a lovely cosy feeling especially when we had the wood burner going. A shame we couldn't utilise the lovely garden space and swimming pool as it was just to cold! The private hot tub, however, was an added bonus and was put to good use. Overall we had a lovely stay there and I wouldn't hesitate to go back there again. Lovely little place in a great part of the word, at a great price too. Accommodation was great, and Gill the owner very friendly and helpful. Can't fault it - just be aware that the internal stairs are quite steep and narrow (but we didn't have any issues as we took care on them) and we couldn't get any wifi in the barn, but that isn't really why you come away is it?! Loved it! We have just returned from holidaying at the Cider Barn, we stayed for 4 nights Monday to Friday. Communication with the owner prior to the trip was excellent and as we were travelling with an 8 month old baby a travel cot, baby bath and high chair was arranged for us- making life a lot easier! Upon our arrival Gill greeted us and showed us around the place, where the pool was, how to work the hot tub. There was even cake on the table which was lovely after a long trip! (We drove from Hull) The barn was spotlessly clean, and even though it is dog friendly accommodation, there was no evidence of this. Again, great when you have little one rolling around the place! It is tastefully decorated and has everything you would need, an extensive kitchen itinery, iron etc. We were lucky to get a few warm days and so made use of the pool, another family where staying at the same time with older children and they had so much fun in and out of the pool and hot tub. There is a larger property available to rent which really is a great place for families. the cider barn is more suited to adults as the stairs up to the bedroom area are quite steep- not a problem for us with the little one though as she cannot walk or crawl yet! The area itself is in a quiet village location, so is so peaceful at night. It is not too far away from things to do though. We visited Glastonbury, Clarks village in Street which is a designer outlet (rainy day!) Langport which has a supermarket and is only a 5 minute drive away. Longleat Safari was a 50 minute drive away but was a fantastic day out and well worth the money. We also visited Bath- gorgeous city! Would recommend a picnic in the gardens along the river Avon. Overall we had a short but very busy and great stay! We would love to come back in the cooler weather as I imagine it would be so pretty in Autumn and could make more use of the log burner! Thoroughly enjoyed our stay here. Perfectly situated in the heart of Somerset, you could (and we pretty much did) spend a week just exploring the places within a 10 miles radius (inc Somerton, Glastonbury and Langport). Easy walks direct out of the barns onto the levels, full of birdlife and even deer. Pubs are walkable too, though are a decent walk and the footpaths can get overgrown (passable in May, but would imagine some bits would be very overgrown come mid-summer). The barn itself is perfect for a couple. Log burner makes for cosy evenings, kitchen well-equipped, has a BBQ, and the garden is private. The other two barns with guests are close-by but never really heard them as the barns are so well insulated (also the entire site is powered by solar panels, so perfect for Eco travellers!). The only slight downside is the lack of internet and phone reception (needed to walk out the barn a bit to get 3G - though am sure this differs by network), and the hot-tub isn't part of the Cider Barn setting but is the other side of the shared swimming pool, so isn't as private as you might imagine when booking. But that doesn't stop me from rating as 'excellent', because the setting, atmosphere, and wonderful hosts, all made for an idyllic stay. When we arrived we were welcomed by both the owners and inside the let was spotless, with a freshly baked cake waiting for us which was lovely after the long drive. The barn itself is decorated to a really high standard and the extras you get like the hot tub, garden, pool and sauna really make it five stars. The local area is gorgeous with two pubs with heavenly food within walking distance and lots of beautiful places to walk and towns to drive to. Really couldn't have asked for a more lovely place to escape to. We stayed at the Cider Barn the first week in June and found it was everything we had been hoping for. Gill and Simon (owners) were there to meet us upon arrival and showed us around. The cider barn is perfect for 2 people and a dog. The garden is a good size and is fully enclosed. We assumed prior to going that the hot tub was shared but were delighted when we realised we had a private hot tub - we knew we could get in it anytime and no one else would be in it. The pool is shared but the week we were there was quiet so we had it to ourselves on the two hotter days of our week. The Cider Barn is a great base for exploring the surrounding area. We visited Bath, Cheddar Gorge, Stonehenge, Glastonbury (which is a fascinating place to sit and have a coffee and people watch). We even travelled down to the Eden Project, which is quite far but was worth the journey. There are a few pubs approximately a mile away. Our favourite was The Devonshire Arms - the food was fantastic. Would certainly return if looking for accommodation in that area again. Thanks to Gill and Simon for a wonderful week. We had a lovely week stay at the Cider barn. Gill and Simon the owners are very helpful and friendly. The barn is dog friendly and has its own fenced off garden area. The sauna and hot tub were a lovely little bonus. The cottages only heating is a wood burner which kept us lovely and warm once we got the hang of it. The Cottage is within a 20 minute walk to a couple of lovely local pubs that serve really good food. There are lots of fields and lanes to go a get lost in. The cottage is in a great location with lots of lovely places to visit within one hours drive including Longleat, safari park, Cheddar Gorge, Lime Regis and Glastonbury. A Lovely place to spend a quiet week.